The couple FINALLY take their relationship public! Reginae Carter FINALLY took her relationship with YFN Lucci public this Sunday (3/25) at ATL’s Instagla! After a few failed attempts at dodging paparazzi while out with her rapper bae, Lil Wayyne’s oldest made things official when she not only popped up at the "grown up prom" event with Lucci, but nabbed prom queen alongside her king. Upon being crowned, the 19-year-old Clark Atlanta freshman and her 27-year-old boo danced and took lots of photos together. Cute, no? Even mama Toya Wright stunted on these youngins at the “prom” after only giving birth to her youngest daughter, Reign Ryan Rushing, at the top of February. Hot! 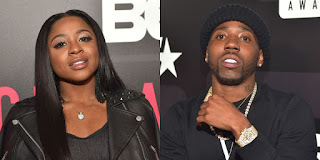 1 Response to "See Reginae Carter And YFN Lucci Get Crowned "Prom" Royalty"